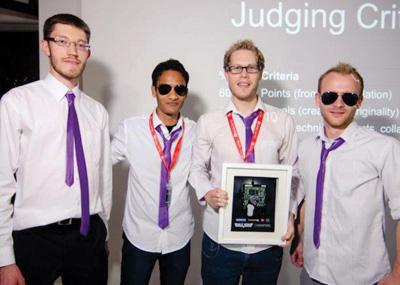 Programming prowess, design aptitude, and a way with flight control algorithms won the top prize for a group of four programmers and designers at the first Hacktivate coding competition. Matthew Gatland, Ahren Koreman-Smit, Roy Packiyarajah, and Gary Buyn beat out five other teams at the event held in late November at Co.Space on Auckland’s Karangahape Road. The theme of the contest was aviation. The teams had to program and design a virtual runway environment with multiple planes landing and taking off. Challenges such as different plane types were added throughout the night in order to test their mettle, with points being handed out for beautiful designs and successful landings, while deducted every time a plane crashed. For their efforts the quartet took home the top prize of $500 cash and three months residency at Co.Space. Gatland, a software developer for Orion Health, also took home the Most Valuable Programmer award. The Most Valuable Designer award went to Luchezar Anastasov from another team. 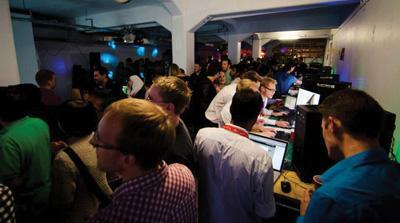 Hacktivate is organised by the same group of students and recent graduates that organised Game of Codes in August. It’s only been three months since Game of Codes, and already its organisers have pivoted the event to open it to a wider audience. Game of Codes pitted university and technology institute programming students against each other in a series of coding related tasks — all the while being watched and supported by an audience well supplied with alcohol. Its new form maintains the spirit of this competition, and its organisers say the goal is still to encourage those who would not otherwise have contact with programming to consider the industry as a career. “It’s not entirely new; it’s more of a fresh start for us. We had a focus on students before, and the events were university orientated. With Hacktivate we’ve decided to open it up to the wider industry,” says Matty Blomfield, co-founder and organiser. Among the 200 attendees at the event there were programmers from industry mainstays like Orion and Datacom (the main sponsor), designers, recruiters, business people and students. One of the main changes from Game of Codes is each team of four must have at least one designer. “The event is now more representative of what it’s like working in the industry,” says Blomfield. The low number of women competing continues to be a problem says Blomfield, although he maintains this is more a representation of the low number of women in IT than the competition format. On the other hand, the large number of women in the audience was very encouraging. Blomfield says Hackitivate still isn’t making a profit, but at the same time the events aren’t bleeding money because of generous sponsorships. He says the team is already planning for the next series of events next year.